These instructions are generalized, and the concepts can be applied to most of our flat moldings. 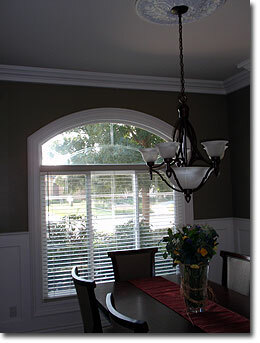 I have an eyebrow window in my dining room and I wanted to install a molding around it that would be large enough to do the window justice. The problem was that the molding I wanted to use was too thick and could not flex. I didn't want to spend hundreds of dollars and lots of time having a custom piece manufactured for the window so for months my window was left bare. Rob Gibson, our multi-talented art director, came up with the idea of splitting the piece lengthwise to create smaller flexible pieces. 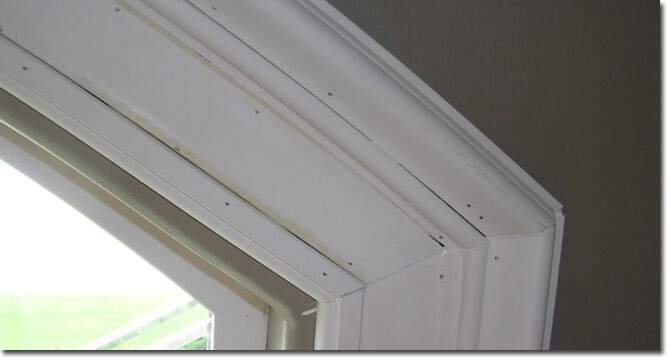 It worked (and was pretty easy to do) so I wanted to share this project so you can see how any of the polyurethane moldings can be transformed into an arch molding. The material I used for the project is the ET-8751 molding. The first step was deciding where to make the cuts. 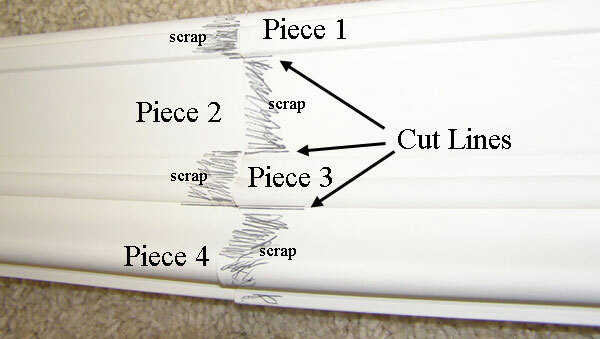 Whenever you are planning on cutting something apart and putting it back together again you want to make the cuts in areas which are going to be the least noticeable. 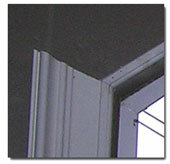 The cuts should be along the lines where there is a change of elevation in the profile of the arch molding. The dashed lines on the profile to the right are the areas where I made the cuts. It split the 5" molding into pieces that were no more than 2" wide. Each cut that you take from the molding is going to leave you short 1/8" from the thickness of the saw blade. Since I was making 3 cuts my final molding would have been 4 5/8" wide (3/8" short of the 5" molding I was starting with). I could have caulked and filled these gaps, but instead I chose to use a different method. I took 2 pieces of the ET8751 molding and lined them up and put my marks on both pieces where I was planning my cut. I then shaded the areas such that when I made the cuts the saw blade removed the shaded areas but nothing from the unshaded areas. From the first piece of molding I was able to get my Piece 1 and Piece 3 for the project and from the second piece of molding I was able to cut my Piece 2 and Piece 4. Now when I put the four pieces together it reconstructed the exact 5" molding. Before installing the arch molding I went ahead and installed the left vertical piece of ET8751. I found that the angle that the arch started up at was about 40 degrees so I set my miter saw to 25 degrees ([90-43]/2 = 25 degrees) and made the outside cut on the vertical piece of molding. 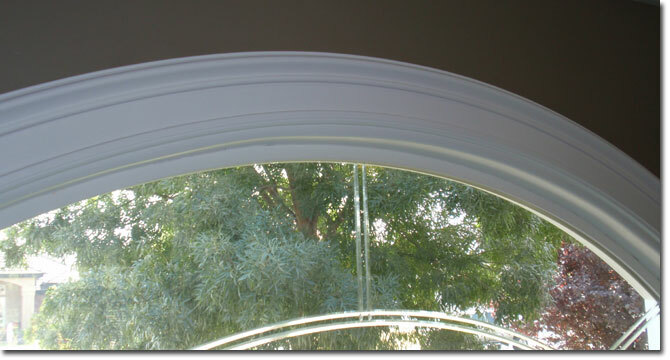 I then put a 21.5 degree angle on each of the left ends of the four arched molding pieces. On the right side of the archway I didn't install the vertical piece until after reconstructing the archway, but I put a pencil mark on the wall where that piece would be so I knew where the arched moldings would end. I waited to miter the right ends of the arched molding pieces until after installing the arch and just used a hand saw to cut the ends off at the pencil mark I made on the wall. With the left vertical piece in place I took Piece 1 and installed it going around the arch. I used a finish nail gun with 1 1/4" brads and put a nail every 10-12 inches. I did the same thing with pieces 2 through 4. One thing I didn't do but should have done was put a bead of adhesive in between each of the arch molding pieces as I was installing them. The adhesive is good to use because it will permanently keep the pieces together. Piece 3 was a little different than the other pieces in that with this particular profile it didn't go flat on the wall. So I used spacers back behind Piece 3 to bring it out to where it was supposed to sit. After all of the pieces were in place it was just a matter of caulking the lines, spackling the holes, and painting the moldings. 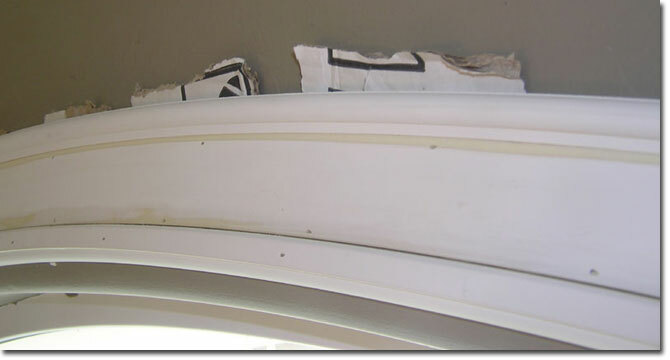 After everything was done even upon close inspection a guest would never suspect that the molding arch across the top of my window was ever four pieces. This method will work with any of the plain polyurethane casings on our website. If you have any questions about how to do your project please call us at 1-800-419-1130.